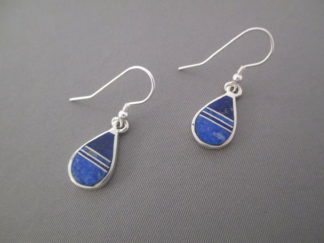 Beautiful Lapis Inlay Earrings! These sterling silver dangling post earrings with Lapis inlay were beautifully made! The two different shades of inlaid Lapis stones add wonderful depth. Made by Native American jewelry artist, Peterson Chee (Navajo).